The Right Pillow Makes for a Good Nights Sleep! Discover the different varieties of pillows and find the right one for you! When a woman gets pregnant, lots of new habits start to take place leading to a number of challenges. One major challenge a pregnant woman faces is sleeping comfortably. It becomes so difficult and nearly impossible to sleep the same way they used to for obvious reasons. The stomach size increases as the newborn develops which has to be handled with much care and sensitivity. That's why it’s important to consider best sleeping positions when expecting and the type of pillow to use during this time. The main concern during pregnancy is the newborn's health. Whether sleeping or awake the mother keeps on wondering if her baby is okay. Sleeping on your stomach is not a good idea when pregnant especially after the fifth month. The growing tummy and tender breast makes it impossible. This may leave most women with an option of sleeping on their back. This worsens the situation. It complicates the baby's health due to lack of enough oxygen and nutrients. Moreover, this position also threatens the mother's health by causing muscle pains and low blood pressure. Doctors advise that sleeping on the left is the best position at this time. It is more comfortable for the mother and safe for the child. On the side, it will be easier for the placenta to nourish the kid and improves circulation. To the mother, it avoids the expanding weight from pressing too hard on the river. Although right side is not that bad the left one is medically recommended. Where a woman can position her pillow when sleeping can make her more comfortable and protect the infant too. Propping a pillow between the knees or under the tummy supports the back and the belly. It also helps someone to avoid rolling on the back or the stomach. During gestation period, a woman may experience shortness of breath. In this case, she can place the pillow under her side to raise her chest for easy breathing. It’s good to use a thin pregnancy pillow to support the belly when sleeping. It should be placed on the side because the woman has ligaments that can cause discomfort in the sacrum. The pillow will enable one feel weightless and more comfortable. A woman can also sleep hugging a body pillow it protects the upper body from pulling forward and the tender breast. This type of pillows is exclusively designed to give support to the whole body. There are plenty of choices when it comes to pregnancy pillows, and one has only to pick the one they are more comfortable using. 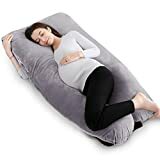 Full body pregnancy pillow as mentioned above gives full support to the body and helps relieve any hip, neck or muscle pains. 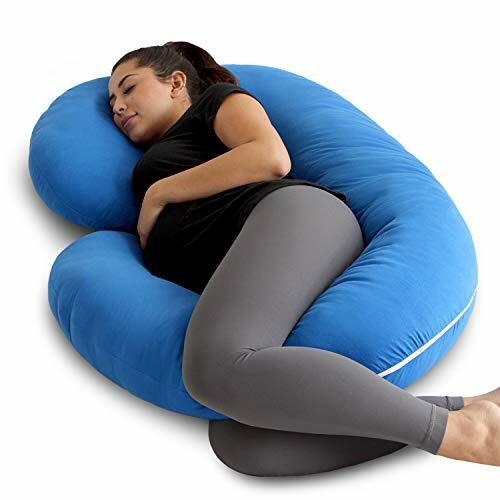 It is flexible and can be placed in any position for total comfort; hugging it, placing it below the tummy or even in-between the knees, are all possible with this type of pillows. It supports the whole body which makes head pillow unnecessary. There is also the pregnancy wedge pillow; it is a wedge just as the name suggest. They are already quite popular among pregnant women because they can be used in different positions as well; under the tummy, behind the back, and even under a regular pillow. There are different letters shaped pillows that are great when sleeping. They are suitable to be placed in any position and also molded in any shape during sleeping. It is advisable to consider all these tips when purchasing a pregnancy pillow. Finding the right and the most comfortable position to sleep during pregnancy is a chore which can be eased by picking the right pregnancy pillow. This kind of pillows is specifically designed to provide ultimate support and comfort to the pregnant woman and the growing baby inside her. Things to Look for When Buying a Pillow Common Sleep Ailments Caused By Poor Pillow Quality How to Choose the Best Pillow for Your Child How Can Buckwheat Pillows Improve your Sleep?